It is also understood Chelsea are considering appointing assistant manager Gianfranco Zola as caretaker boss until the end of the season if they decide to part company with Sarri. Zinedine Zidane and Frank Lampard have been identified by Chelsea as potential replacements for head coach Maurizio Sarri after internal discussions, Sky Sports News understands. Chelsea are understood to be very concerned about the team's recent performances and results - the most recent of which was a home defeat to Manchester United that knocked them out of the FA Cup. The board are aware of the scale of the problems at the club, especially after the reaction of supporters at Stamford Bridge on Monday night, who booed the team off and slated his 'Sarri-ball' style. Zidane has not been in a job since he left Real Madrid at the end of last season after winning a third consecutive Champions League trophy. Former Chelsea midfielder Lampard took his first steps into football management with Championship club Derby at the start of the season and has taken the team to within two points off the play-off places. 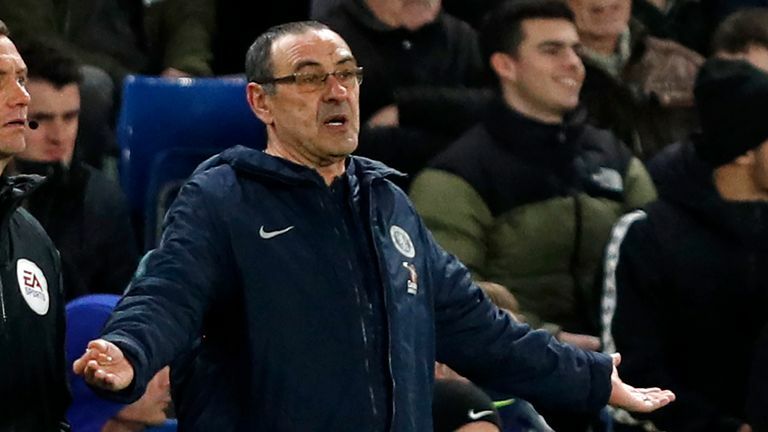 Sarri was put under increasing pressure after a 6-0 hammering at Manchester City earlier this month - their third Premier League defeat in four games - saw them drop out of the top four to sixth in the table. The Blues had conceded four away at Bournemouth in the previous game following a 2-0 loss to Arsenal at the Emirates, after which Sarri questioned whether his players could be motivated at all. The Italian, who succeeded Antonio Conte following his acrimonious departure last summer, faces two crucial games to close out the week - a Europa League last-32 second leg against Swedish side Malmo FF, with his team 2-1 ahead, and the Carabao Cup final at Wembley against City. Zola - the former Chelsea forward - defended his boss' position in the build-up to the United defeat, insisting they were going through a tough spell in pursuit of a breakthrough in his philosophy. He also insisted the players do care, and compared their situation to the difficulties Pep Guardiola endured during his first season at the Etihad. But Sarri admitted he was concerned about the result to Ole Gunnar Solskjaer's resurgent United, stating his side had played "confusing" football in the second half. "I am worried about the result not our fans," he said. "Of course I can understand their frustration. The result was not very good. We are out of the FA Cup. "We played confusing football in the second half but in the first half I think we played well. We need more aggression and more determination in the situations inside our own box and inside the opposition box. The difference was there."